From using a spin bike to generate electricity in the Woodruff PE Center to planting a student-run garden on Eagle Row, winners of this year's Sustainability Incentives Fund grants have diverse plans to help Emory achieve its green goals. Every year, Emory’s Office of Sustainability Initiatives (OSI) invites students, faculty and staff to apply for its Incentives Fund, a small grants program intended to fund innovative, timely and impactful research and projects that will foster sustainable knowledge and habits on Emory’s campus. 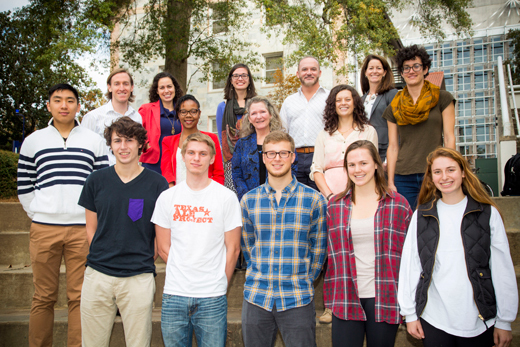 The twelve projects selected for the 2015-2016 Incentives Fund will contribute to critical campus discussions about the intersections of sustainability with other social concerns and support research and planting projects that will improve the environmental health of Emory, among other important efforts. “The OSI Incentives Fund allows Emory community members not only to tell us what their hopes are for sustainability at Emory, but to lead and realize the research and projects they want to see,” says Taylor Spicer, sustainability programs coordinator in the Office of Sustainability Initiatives. “The collective creativity, passion, and commitment represented in the submitted applications is an inspiring testament to Emory’s commitment at all levels to improving multiple facets of the sustainability of our community," Spicer says. At a luncheon on Nov. 17, recipients of this year's Incentives Fund grants were honored for their efforts. Collectively, the 12 projects will share a total of $14,000 in funding. • Feminists in Action Awareness Week (team leader – Rupsha Basu): A week of educational, interactive activities to engage the Emory community in conversations about the intersections of sustainability and women’s issues, especially related to the use of menstrual cups. • Electricity-generating spin bike in the WoodPEC (team leader – Madeline Brown): An effort to install an electricity-generating spin bike in the WoodPEC that will be used to workout and simultaneously create and store energy to power electronics in the studio. • Relabeling recycling infrastructure in Woodruff Library (team leader – Dawn Francis-Chewning): An effort to upgrade existing recycling infrastructure to improve waste diversion in this highly-trafficked building. • Student-run garden on Eagle Row (team leaders – Karly Hampshire and Jonathan Kaminski): An initiative to create and maintain a student-run vegetable and herb garden on Eagle Row that all student residents on the Row can engage with to learn about sustainable food production. • Research on the use and impacts of pesticides on campus (team leader – Winston He): Student-led research project to measure the environmental impacts of pesticide use on and around campus that will be presented to specific campus decision-making bodies and the wider Emory community. • First-year quad waste diversion outreach and education (team leader – Shannon Hill): A pilot outreach and education project focused on changing knowledge, attitudes and behaviors related to waste diversion in and around the first-year residence halls that encircle the first-year quad. • Mapping invasive species in Lullwater Park (team leaders Will Milligan and Sean Brooks): An effort to use Geographic Information Systems (GIS) software to map the invasive species in Lullwater Park to be used by Campus Services to inform invasive species removal projects. • Establishing shrub and herbaceous layer along Oxford Road (team leader – Jamie Nadler): An initiative to plant shrubs and other vegetation below the tree canopy in the reforested area behind the Math & Sciences building along Oxford Road to improve and measure the soil health and carbon sequestration of this area. • Food, health and sustainability educational Event (team leader – Lolade Olowolayemo): An engaging educational event led by the Resources and Insurance Navigator Group (RING), a campus student group, that will foster conversations about the intersections of food, health and sustainability. • CSA cooking classes for Oxford student groups (team leader – Shambavi Rao): A pilot program to purchase a community-supported agriculture (CSA) share from Daniel Parson, the farm manager of the Oxford Farm, to be used by various student groups on the Oxford campus to cook with each week during the spring semester. • Cultivating bike culture at Emory (team leaders – Conner Sears and Andriana Miljanic): The launch of a Bike Ambassadors program that will identify and support existing cyclists on campus, who will promote bike culture and community by helping potential cyclists overcome barriers to riding bikes to, from and around campus.